Fully compliant with latest ATEX and IECEx standards, including OPIS optical intrinsic safety. THE LINKEX™ WF-300®XL LED FLOODLITE IS A HIGH PERFORMANCE, ROBUST, LIGHTWEIGHT AND PORTABLE FLOODLITE FOR USE IN POTENTIALLY EXPLOSIVE ATMOSPHERES. IT DELIVERS AN OUTSTANDING LEVEL OF WHITE LIGHT AND IS FULLY COMPLIANT WITH THE LATEST ATEX AND IECEX STANDARDS, INCLUDING OPIS – OPTICAL INTRINSIC SAFETY. FITTED WITH WOLF’S UNIQUE SOVI SYSTEM TO ENSURE SAFE OPERATION, THE FLOODLITE IS CERTIFIED FOR SAFE USE IN ZONE 1, T4, IIC, -40°C TO +55°C AMBIENT, HAZARDOUS GAS, VAPOUR, MIST OR DUST ENVIRONMENTS. The WF-300®XL produces a class leading 6,378 lumens of bright white light which effectively illuminates the workspace, using a low power consumption of 55(LV)/62(HV) watts. Shadowing is reduced by multiple light sources – two independent drivers and two independent LED panels of 18 LEDs with each LED having an encapsulated optical device. This patented design gives a 33-degree beam angle which gives long distance and wide area illumination. The high reliability LEDs are designed to give over 100,000 hours life, with LED life being assured by efficient heat dissipation through built in fins and electronic thermal control. The independent panel and driver system provide failsafe reliability and ensure operators are never left in the dark. User safety is further increased with the unique Safe Optimal Voltage Indicator (SOVI) which alerts the user by pulsing the beam if the lights are running outside the certified and optimal voltage ranges, maximising both safety and performance. 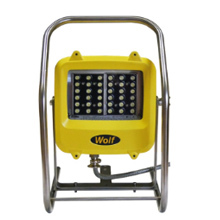 The user can therefore link together multiple mains Floodlites, safe in the knowledge that they are operating within the certified voltage range. In addition, both the HV and LV Floodlites are certified safe down to 0 volts. The WF-300®XL is cable powered and available in two voltage options: 18-50V AC/DC and 90-264V AC/DC. Both versions come fitted with 10 metres of SY cable with an ATEX plug, with other options available. The high voltage version can be fitted with a LinkEx socket enabling up to 20 lights to be linked together in a daisy chain and powered from a single power source to illuminate large tanks and tunnels. 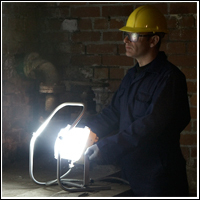 The WF-300®XL LED Floodlite is manufactured from materials tested and proven in the harshest environments and is ideal for Hazardous Area Temporary Lighting. The enclosure is made from marine grade aluminium; the lens is toughened, scratch, impact and chemical resistant glass. Further protection is offered by the frame which is constructed from 316 grade stainless steel with the lens and body being able to withstand an impact of 8 joules, four times the minimum requirement. The WF-300®XL is sealed dust tight and protected from water ingress with a certified IP66/67 enclosure. A wide range of accessories are available including magnet fixings and tripod stands. 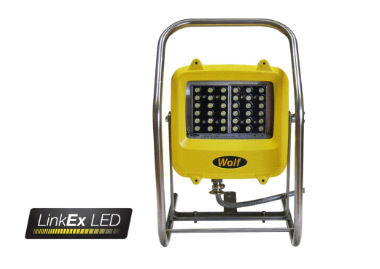 With full support and servicing available from Wolf’s Sales and Technical team, the WF-300®XL offers an efficient, cost effective and truly versatile lighting solution for use in potentially explosive atmospheres in the world’s harshest environments. The robust but simple Floodlite design ensures easy maintenance and cable replacement. It is quick and easy to disassemble, remove and replace parts and then re-assemble. Our innovative design allows the independent drivers (which can be replaced individually), LEDs and virtually all other parts to be replaced. Each product is supplied with full instructions which include a parts list indicating the replacement part number and details on how to replace it. The WF-300®XL is available from stock and is designed to work together with the existing range of LinkEx™ LED Temporary Luminaires, transformers, splitter boxes and extensions to provide a complete Hazardous Area temporary lighting system.